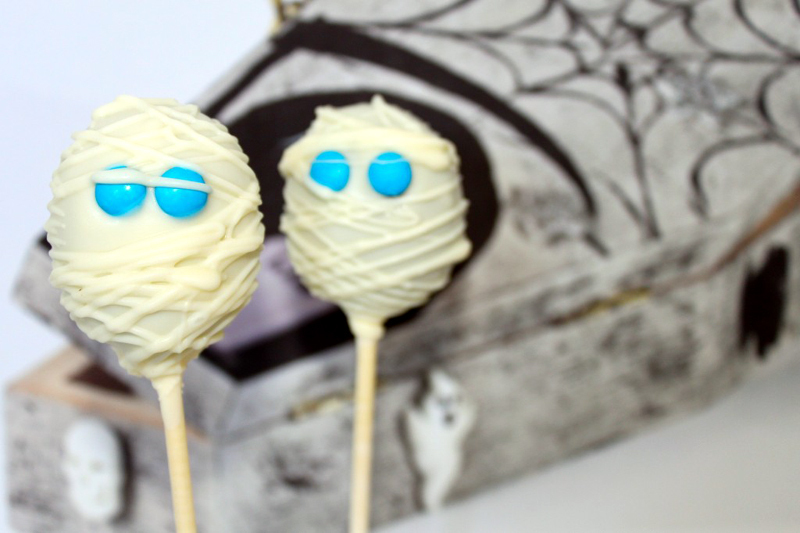 Learn how to make these cute and spooky, simple Halloween cake pops at home. I absolutely love Halloween – we don’t celebrate it much in Australia but I always make sure I have sweet treats for the handful of kids that come knocking at my door. 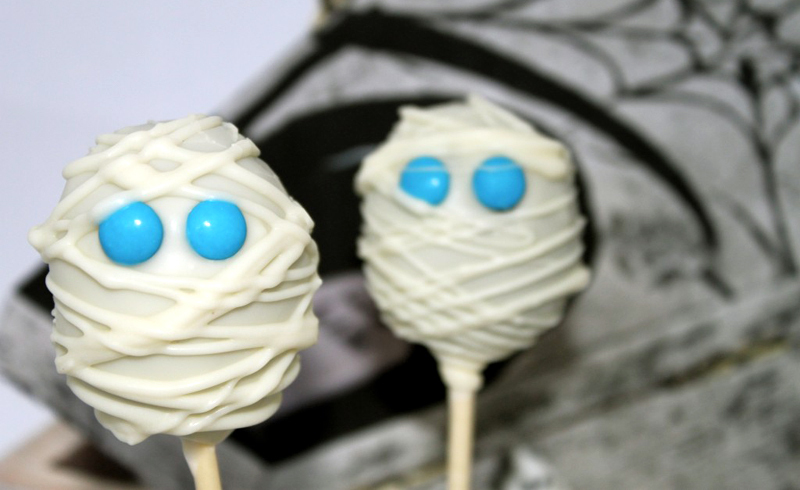 This year I’ll be handing out Mummy Cakepops and I thought I’d share my super easy tutorial for some fun, not too scary Halloween cakepops. I love these pops because they’re quick, cheap and easy to make, and they’re homemade so the kids will enjoy getting something a little bit different to the usual candy assortment. You can view the full comprehensive video tutorial below or you can read on below for step by step instructions. Step 2: Take 200ml whipping cream and 200g dark chocolate and microwave for 1 minute intervals until completed combined (approx. 2 minutes total) Stir until there are no lumps. Step 3: Pour chocolate mixture over your chocolate cake crumbs and stir until all the chocolate mixture has been absorbed and you have a workable chocolate truffle-type mix. Step 4: If it’s a little soft to work with, refrigerate for 20 minutes prior to use. So, that’s the basic recipe sorted and now we need to take this deliciously messy chocolate mix and turn it into spooky Mummies! Roll your cake pop mix into a nice round ball, then elongate it just a little to make an oval shape. Place in the fridge for 5 minutes to firm up. Melt your white chocolate using a microwave, chocolate pot or double boiler. When your seal is dry and your pop is chilled, dip your mummy head into the melted chocolate, ensuring your chocolate covers the seal completely. Gently tap off any excess chocolate. Before the chocolate sets completely, attach your mini m&m ‘eyes’, ensuring the “m” is facing towards the chocolate and not visible. Leave the pop to completely set. Your cake pops are completed and ready to serve!